Application Deadline Extended! Award Increased! Due to the newness of the Foundation, notice of the scholarship has not reached enough eligible applicants. Therefore, the application deadline has been extended. All applications must be complete and received on or before July 31, 2011. The award will be made mid-August. Also, thanks to successful fund raising and generous supporters, the award amount has been increased to $2500. Urgent - application deadline is May 31, 2011! The Helen Gee Chin Scholarship Foundation officially announces the availability of college scholarship awards, starting with the 2011-2012 academic year. The Foundation was formed to honor the memory of Helen Gee Chin, wife of Sifu Chin. Simo was beloved by her husband, the students of the Academy that she ran with him, and by the martial arts community as a whole. The Foundation plans to offer scholarships to encourage academic achievement by serious students of the Chinese martial arts. 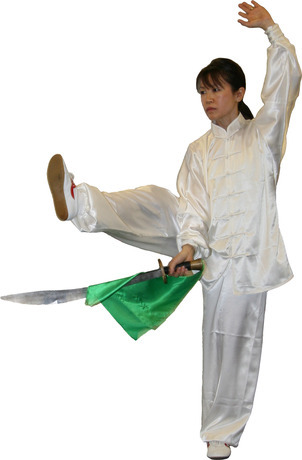 The scholarship will be open to high school students across the country who are entering college and meet the minimum eligibility requirements: U.S. citizenship, five or more years of study in Chinese Martial Arts (Kung Fu, Wu Shu, or Tai Chi), and a "B" average grade or better. After the first year, the scholarship may also be open to continuing college students enrolled in undergraduate studies. Scholarship recipients will be selected based on criteria such as martial arts study and achievement, academic achievement, a written essay, and participation and leadership in community and school activities. Further details about eligibility and the selection process can be found on the scholarship application form, which can be downloaded from the application page.